Whether you’re pursuing a career as a loan officer, processor, banker, accountant, stock broker, analyst or any other kind of finance-oriented position, you’ll know that it takes a certain skillset and personality type to be good at what you do. But it’s not all about mathematics and analytical thinking. 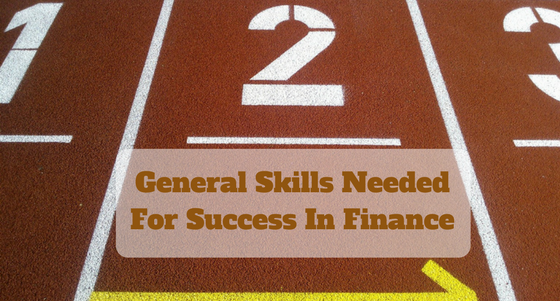 I’ve spent some time thinking about these requirements, and I’ve put together a short list that will give you an overview of what to concentrate on when improving your finance skills and building a base for career advancement. Being able to identify and make use of the forces that are moving the current financial developments — be it the political climate or societal events — is a must for someone who works with other people’s money. Keeping track of new developments, knowing the forecasts and estimations and always being up-to-date with world’s financial movements are all activities that help you gain insight in what influences the financial indicators such as stock values or mortgage rates. It’s important to be an excellent analyst and planner, and to have mad Microsoft Excel skills, but it’s all in vain if you’re not able to put all the information in English and share it with people on the other side of the table. You need to learn to keep people informed, be clear and consistent, provide answers to questions within reasonable time frames, but most of all: to listen. Communication isn’t only about getting your point across, but also about taking your client’s thoughts and feelings into consideration and acting on them. The ability to make (and to help make) informed decisions quickly while avoiding errors is often what determines whether you’re a good fit for a career in finance or not. Balancing an on-time schedule, the best deal for your client and a good reputation for yourself is hard, especially when competition is fierce and the speed of information is practically instantanteous. That’s why, if you want to keep your customer satisfied, you need to learn to make the right decisions fast, and in a correct manner. Missing a deal or rushing things to get them off your plate are obviously not the way to go here, but equally, you can’t dawdle. There’s an expression I learned from an engineering friend of mine: good, fast, or cheap — pick any two. If you provide good advice, promptly, you’ll but yourself into a great position to be charging (and earning) a premium. Being good with apps, using cloud for storage and communicating via texts is something a modern client expects you to do. It’s the extras that count. Electronic signatures, security encryption, video conference calls — again, it all comes down to following the trends, being open to innovation, and implementing it in your working process, in order to speed up and improve your service without cutting down on precision, quality and customer experience. If you’re looking to make a move into any finance field — whether you’re thinking about attending college, studying to become a certified financial planner, or anything else — take a step back and assess your capabilities in each of these four skills. Then (assuming you still want to continue), do what you can to improve them.